The Hood Museum of Art is a physically small museum, but their collections are extensive; we are lucky enough to see them when the museum mounts special exhibitions. I wrote about an exhibition of their Native American collection here, Native American ledger drawings here, and their outstanding collection of contemporary Australian Aboriginal art here and here. 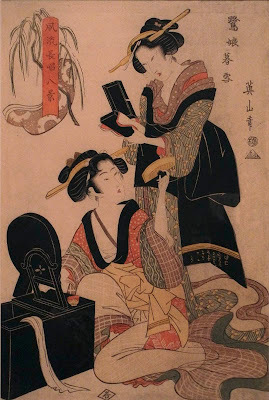 I recently had the pleasure of seeing a beautiful exhibition of outstanding Japanese prints titled "The Women of Ukiyo-e: The Judith and Joseph Barker Collection of Japanese Prints". 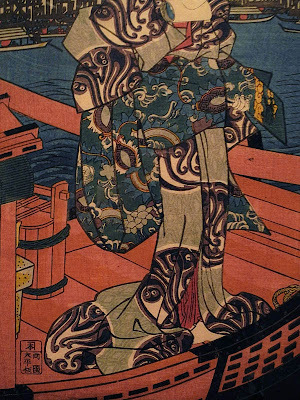 Images of the "floating world"––ukiyo-e––a world of actors and courtesans, became a subject for prints in the late 17th century. The curators of this show chose to focus on the women of that world, leaving out the many images of famous actors. The compositions of the prints range from complex, as in the two triptychs I am showing here, to fairly simple; the color is subtle and harmonious. What most interests me, what I have chosen to focus on, in this group of prints is the way line flows gracefully from one form to the next, sometimes its curves are alongside the straight lines of architecture. Within the sinuous lines are patterns accentuating the form, or flattening it. 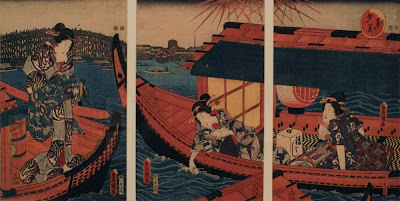 I am sorry that I forgot to photograph the wall label for this stunning triptych, so don't whose work it is. The sweeping curve of boats across three panels is quite dramatic. As always, you can click on images to enlarge them. 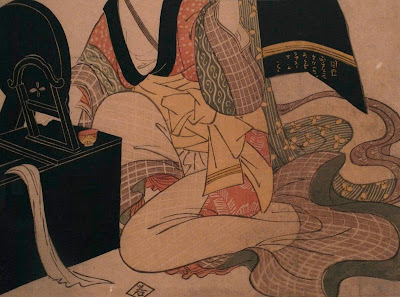 I was particularly struck by the complexity of pattern in the woman's kimono, and how a bold design is contrasted with the more detailed design of the obi, or wide sash. ...where they divide the cloth into numerous patterns. The sensitive outlines also express the underlying form of limbs; we get a feeling of volume without any modeling of light and shade. Japanese printmakers are masters of the tall, thin composition, here creating dynamic energy and fullness in a tight format. Tall narrow compositions were known as hashira-e, "pillar prints". I love the way the geometric pattern interacts with the floral: so rich and so unexpected. Quarrels between two lovers may, perhaps, be swept away with a broom. 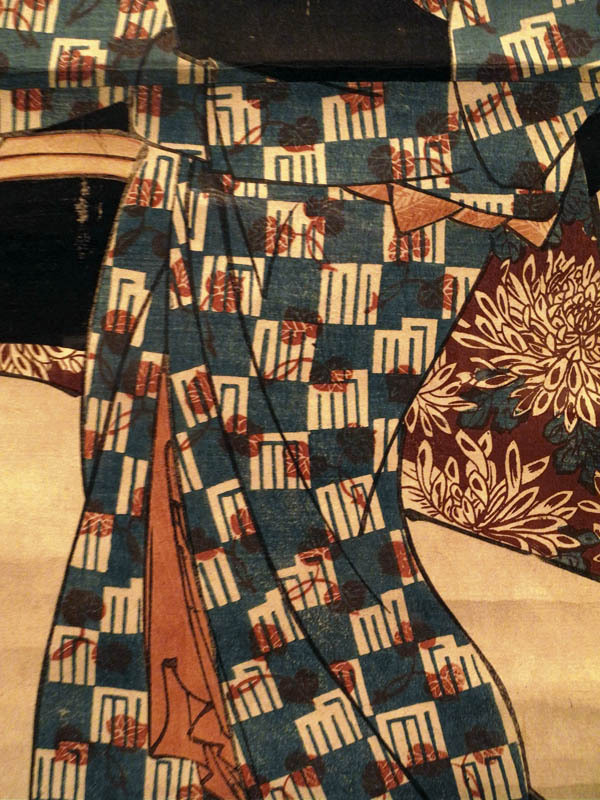 The long vertical lines are different from those of the patterned robe, yet emphasize a harmonious mingling. 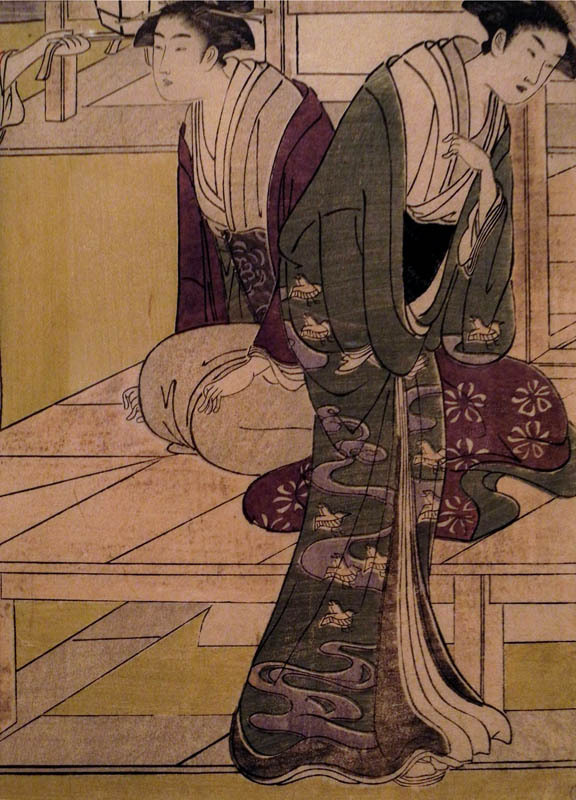 This print is so elegant, so simple: a movement of line from the voluptuous headdress down the neck, into the dark outlines of kimono, and circling back up the arm and hand. 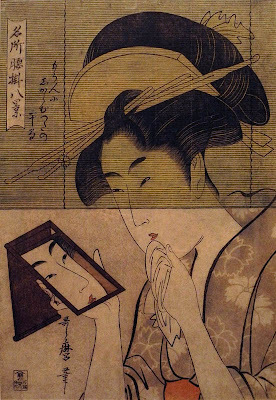 There is only a subtle pattern in the clothing, but then the artist surprises us with the thin screen covering half of the woman's face; her reflection is open to us, her actual self is hidden. The distant floating world is present and beautiful to us in these prints. *A note: I took these photos at the museum, and with nothing to compare them to, I am guessing as to the color. I think it's close enough to give a good idea of the work. A Walk in the Woods: "....to see what is there." I Remembered Joe Brainard's "I Remember"
A New Textile: "Color Circle"
A New Painting: "Three Shapes"
A New Textile: "Blue Ribbon"